There is a scene early on in Fighting Season in which the families of a fallen soldier are standing outside their homes on an army base in Western Sydney, as his widow & family go to collect his coffin. The men are saluting, the women stand in silent tribute and the children hold Australian and Boxing Kangaroo flags. It struck me as the kind of scene we might expect in an American drama, such as Army Wives. Fighting Season, Foxtel’s new 6 part drama, sprang to life from an idea when Goalpost Pictures producers Kylie du Fresne & Rosemary Blight were at an American airport and were struck by the deference to US soldiers boarding first, afforded privileges having served their country. While the genre may be war thematic, this is no ANZACs nor Tour of Duty action series. 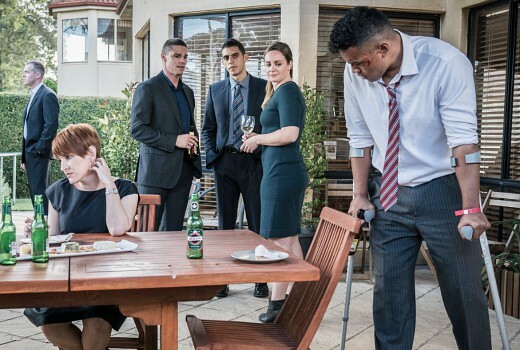 Most of the drama is set in Australia after soldiers have returned home from Afghanistan in 2010. And amongst the 5 who have come home, all of them are in a brutal recovery stage. The one who didn’t make it is Cpt. Ted Nordenfelt (Ewen Leslie), killed in action in the opening scenes. It’s a death that weighs heavily on Sgt. Sean “Speedo” Collins (Jay Ryan), a brooding young soldier struggling to deal with his Post Traumatic Stress Disorder as he returns home to his young wife Vanessa (Sarah Armanious) and family. His fellow troops Jarrod (George Pullar), ‘Izzy’ (Marco Alosoi) and ‘Pepsi’ (Julian Maroun) all bear the scars, physical and emotional, from the inciting incident whilst protecting a local Afghani village. Ex-soldier Corp. David (Paul De Gelder) having already lost his leg, and forearm in an IED attack in Afghanistan, does what he can for his returned mates. While writer Blake Ashyford explores the harsh reality of returning to Australia life – from finding girlfriends have moved on to addiction, isolation and psychologist sessions – it is contrasted with a mystery element around what really happened on the ground. These are depicted through various flashback scenes (thus allowing Ewen Leslie his share of screen time). But it is Jay Ryan at the centre of this tale, bottling Speedo’s anger and struggling to face emotions. Light years away from his Neighbours and Go Girls days, he has tapped into an inward acting style that draws in binge viewers. Kate Mulvany is another stand-out as wife and mother whose faith in the armed forces is challenged. Young actors George Pullar, Marco Alosoi and Julian Maroun all make a credible platoon that is imploding and the drama allows for sub-plots where each gets to shine. Also appearing are Lex Marinos, Camilla Ah Kin & Rhys Muldoon. There’s no question this is a tough sell, and the balance is necessarily tipped towards characters mired in personal torture. But under director Kate Woods it’s also a sincere and committed look at a subject rarely tackled in Australia. War scenes try hard to recreate dusty scenes in Afghanistan but lack the scale a bigger budget might afford. Fighting Season may not be everybody’s cup of tea, but is a credit to all involved. Fighting Season screens 8:30pm Sundays on FOX Showcase. Thank you David for this review….as the wife of a Vietnam Veteran and the Mother-in-Law of an Iraq and East Timor Veteran I am well versed in what happens when our troops return from war. I am still in two minds about watching this but your review has helped. I do hope it gets a good audience as the general public need to know how our returning troops and their families (don’t) cope.